I love my new computer, it's so pretty and shiny and the best part is that it works! So I'm thinking I should give it a name so it feels loved and welcomed here and maybe will work really, really good for a long time! Whaddya think? Name ideas? Anyone? Ok, think about it and let me know. Now, let's take a look at a very fun card! Isn't it adorable? I know, right? Connie said she'd gotten her inspiration from several other card she'd seen so I'm not sure who the originator of this idea is, but it sure is cute so thanks to all of you who've made one! The gals in my classes loved this card, so I guess I'll have to do more punch art in the future. I started with a base of Tempting Turquoise cardstock, layered it with Daffodil Delight cardstock, then added a layer of Wild Wasabi Patterns Designer Series Paper from the Subtles Pack. The pattern for my "pond" was made by cutting out the inside cardboard from a SNAIL refill package. Can you see the shape? That made it easy for everyone to trace and cut from pieces of Tempting Turquoise Patterns Designer Series Paper from the Brights Pack. The "splashes" are punched out with the two small petals in the Build A Blossom Builder Punch from Tempting Turquoise cardstock. For the baby duck, I punched his body with the 1 3/4" Circle Punch and made his little pointy tail by punching out a portion of the circle with the Large Oval Punch. His head was made with the 1" Circle Punch and his wing was another petal from the Build A Blossom Builder Punch. The beak is the tip of the Small Heart Punch made with Pumpkin Pie cardstock. A little googly eye from a craft store completes this cute little guy! The greeting was done with Teeny Tiny Wishes and the Word Window Punch layered on the Modern Label Punch. I added the Brights Button with Whisper White Baker's Twine for a little accent and the card was done! We did stamp an inside verse from the Curvy Verses stamp set. I don't know about you, but I think this card came out super cute and I'm anxious to have someone to send it to! If you want to recreate it, you can shop 24/7 at my Online Store. I've included a handy supply list below for you with all the item numbers you need. Have a great day stampers! I'll be back tomorrow with an all new Simply Stampin' Up! project for you. 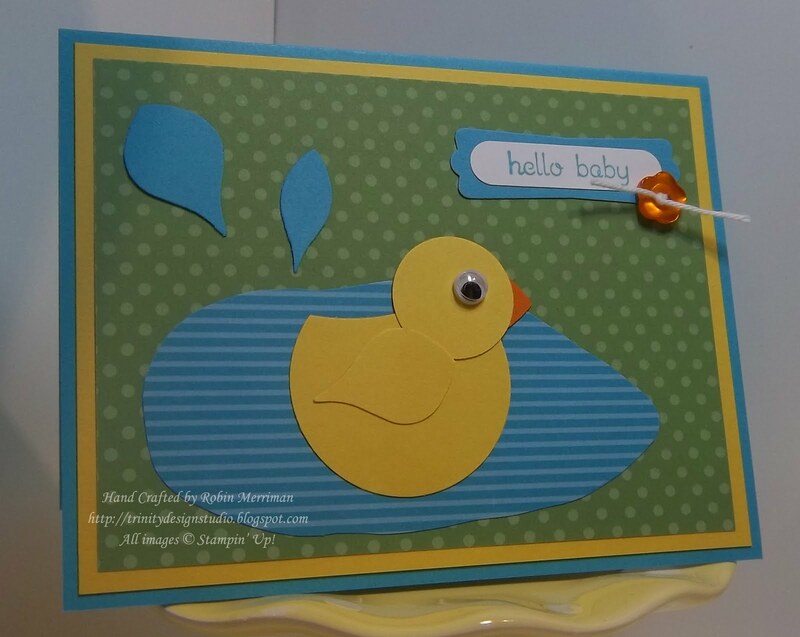 That ducky is super cute! !